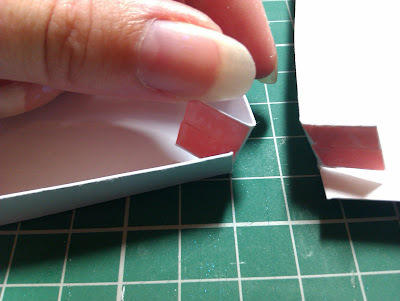 Crafty Loops: Tutorial - how to make a box for your dimensional cards. Tutorial - how to make a box for your dimensional cards. 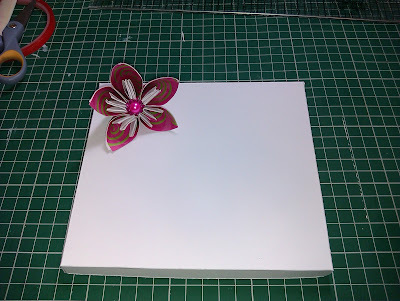 This tutorial will give the measurements and formula for making a box for a 6x6inch square card. HOWEVER....the formula I use to make this card is easily converted into other sized cards like 5x5, 8x8 etc. 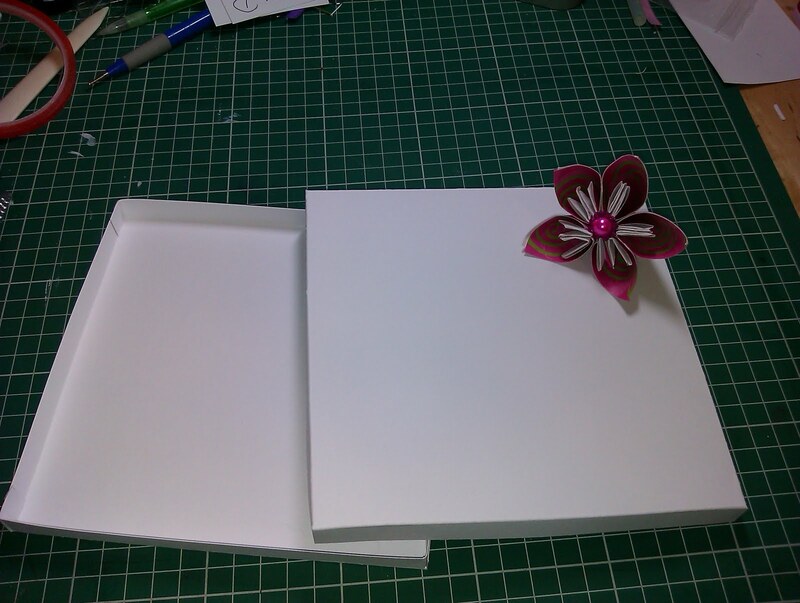 2 x A4 sheets of cardstock, white or patterned whichever you want for your box. If your card is 6x6 inches you wont want your box to be exactly 6x6 as the card wont fit in, it will simply sit on top and this is NOT what we want. So, I usually add on 1/4 inch which gives room for the card and embellishments. Therefore you will want the card base to be: 6" 1/4 inches x 6" 1/4inches. 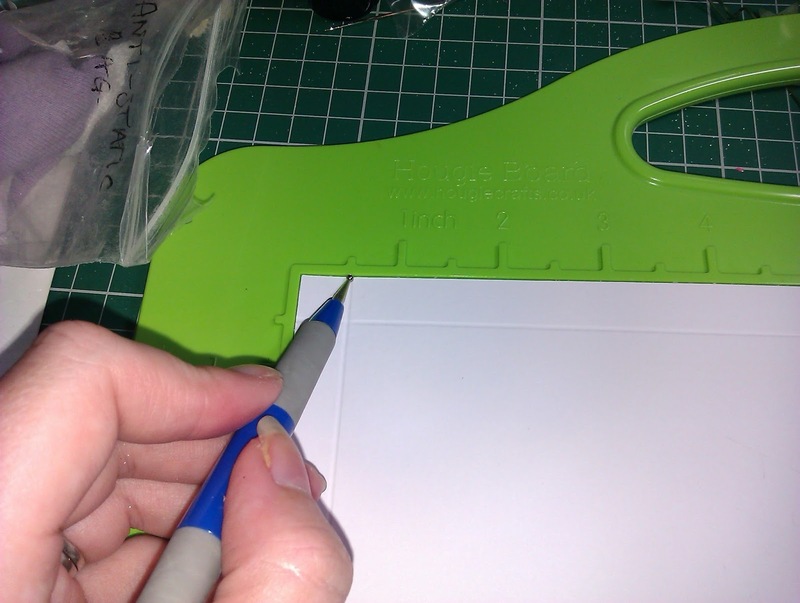 DO NOT CUT YOUR CARDSTOCK YET!! This is just the measurement for the part the card actually sits on, you need sides to your base so don't cut anything yet, your box still needs sides. 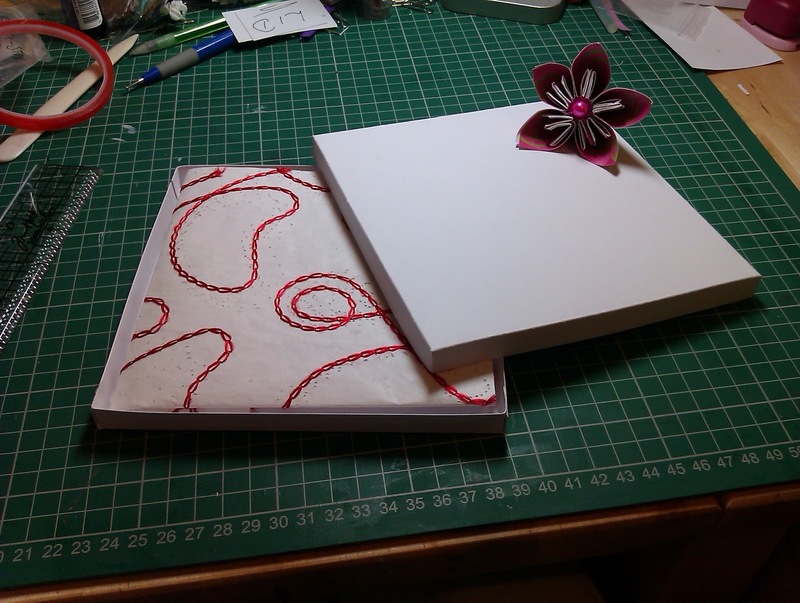 Now depending on how heavily your card is embellished you need to think about the height of the box or how thick the box needs to be and add this onto the size of your card base. You obviously need it to be thick enough to fit the lid on and not squash flowers or embellishments you have on your card. For the purposes of this tutorial I've decided to make my box 1/4 inch thick. But obviously you can add on whatever height you think you need. Sum again without words!! 6 1/4 "+ 1" = 7 1/4"
So you need a piece of cardstock measuring 7 1/4 "x 7 1/4" for your base of your box. So go ahead and cut the base piece of cardstock and leave aside for now. Now, obviously the lid has to be that fraction of a bit bigger than the base so that it can fit over the base. 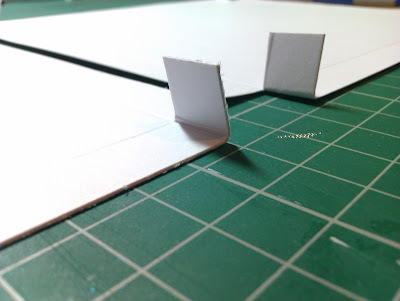 I have calculated for a nice and secure fit, you only need to add 1/16th of an inch on all 4 sides of your cardstock to give a secure fitted lid. So to make your lid we will take the measurement we had from the base, and add the extra 1/16th of an inch to all 4 sides so the lid to fit. So your base measurements were 7 1/4 " by 7 1/4". But to add 1/16th of an inch onto the base size, we again need to multiply that figure by 4 to represent 1/16th of an inch of space on all 4 sides of the lid so it can be that little bit bigger. So if your base size is 7 1/4" by 7 1/4" you will need to add on your extra 1/4 inch needed for the lids 4 sides. 7 1/4" by 7 1/4" + 1/4 inch = 7 1/2 " x 7 1/2"
So.........your lid cardstock will measure 7 1/2 " x 7 1/2"
This formula can be used for any card size. You just have to remember that you need to add on your box's height to all 4 sides of your cardstock. And when making the lid, add on the little smidgen extra for the lids size on all 4 sides. Right, so you have cut your 2 bits of card, one at 7 1/4" by 7 1/4" representing your card base and your lid cut at 7 1/2 " by 7 1/2"
Once you have all sides scored on each piece of carstock, you will notice at each corner there is a little square. You need to cut one of the lines down to the end of the little square. It doesnt matter if you cut at the side or bottom, but for a sleek look cut all 4 slits in the same direction, choosing either the side or bottom line to cut. So you are now left with these little tabs on all 4 corners of each bit of cardstock. Fold them in towards the inside and using a bone folder or just your fingers, fold all the rest of the folds inwards, see below. Make sure your little tabs are on the inside. Now glue or strong DST time!! Place your glue or the strong DST to the small tab back so it butts up against the back of the box wall. Line it up so you have a clean level box seam. Once you have done this to all 4 sides of each bit of cardstock you now have a box base and lid that holds a 6x6inches card. And thats it. Easy as that!!!! Once you get your head around the maths it really is very simple. And remember, you can use this formula for any sized card....give it a go. You can obviously decorate it any way you want or use patterned cardstock instead of plain whit card. If you want to make the lid a little easier to open, use a circle punch at each side of the lid to cut a little semi-circle thumb lift. This makes the lid a little easier to open. And if you would like to make your box a bit more decorative, before you glue the sides together you could cut a decorative aperture window into the centre of your lid and put acetate behind it. Then tape up the sides as directed and you have a beautiful box with an aperture acetate window. Hiya loops! I made it over & have had a lovely snoop about your blog! I'll be back to look at your tut's again! 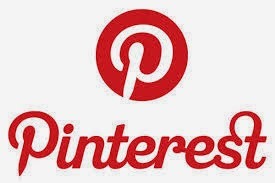 Thanks for being a follower of my blog & I'm about to become a follower of your blog! very creative!!! thanks for sharing the tutorial! hey, please stop by the pixie blog, we are having a giveaway! I'm going to bookmark this! This is so encouraging. Im doing it right away. LOvely easy to follow instructions, thanks so much. Fabulously clear instruction - thank you. great tutorial, very helpful. Thank you. Thank you so much for this information on making boxes! You explain this very well and make box making look very easy. I am going to give this a try tomorrow morning (as I am writing in the middle of the night.) I'm so glad I found your site! I am definitely going to bookmark Crafty Loops! Thanks again for your wonderful insight, explanation, and instructions! Finally found someone to explain how to make a box. 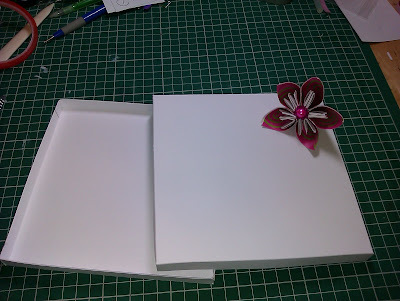 I made an 8x8 wedding card and wanted a box to decorate for the cards. I need a tutorial on how to make an 8x8 card box for all my 8x8 cards can someone help please. Thankyou so much for making tutorials. I really appreciate when others share their skills so we can pass on what we know. P.S. Sorry I don't have an account. I really couldn't be asked. Sorry for being lazy. thanks for the tutorial! I've been looking for this almost a day! How do i make an 8x8 card box with a depth 1" please can someone help..
Hi Jamie. My tutorial here should help you make a box for an 8x8 card. It's very simple maths. 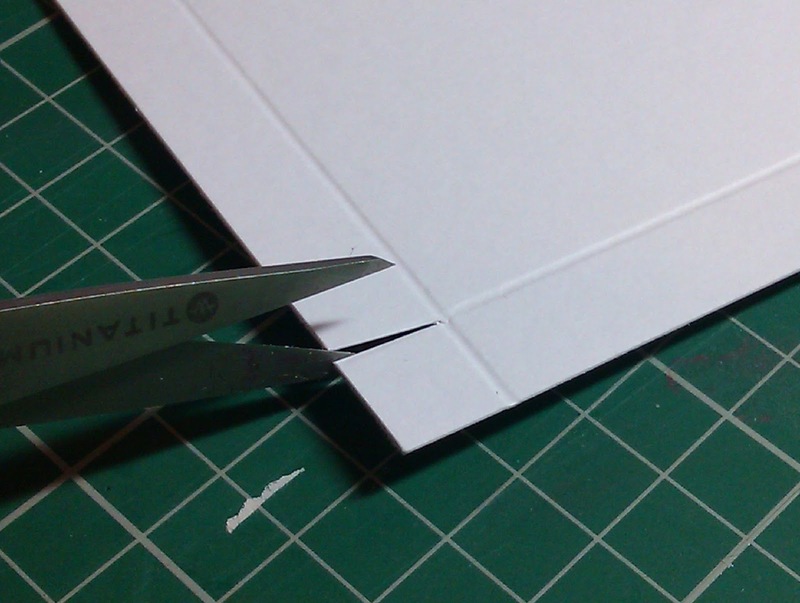 Just follow the instructions in this tutorial but for an 8 inch card and you'll be making boxes in no time.